The Suddenly Salad bacon ranch salad is a great side dish to bring to a picnic or to serve as a side dish. If you aren’t familiar with the Betty Crocker Suddenly Salad packages, you are missing out on an easy way to make pasta salads. The Suddenly salad pasta salads are easy to fix and tasty. Suddenly Salad boxes come with flavoring packages. This copycat suddenly salad recipe for Ranch & Bacon comes with a festive mix of vegetable blend and seasoning and imitation bacon bits. 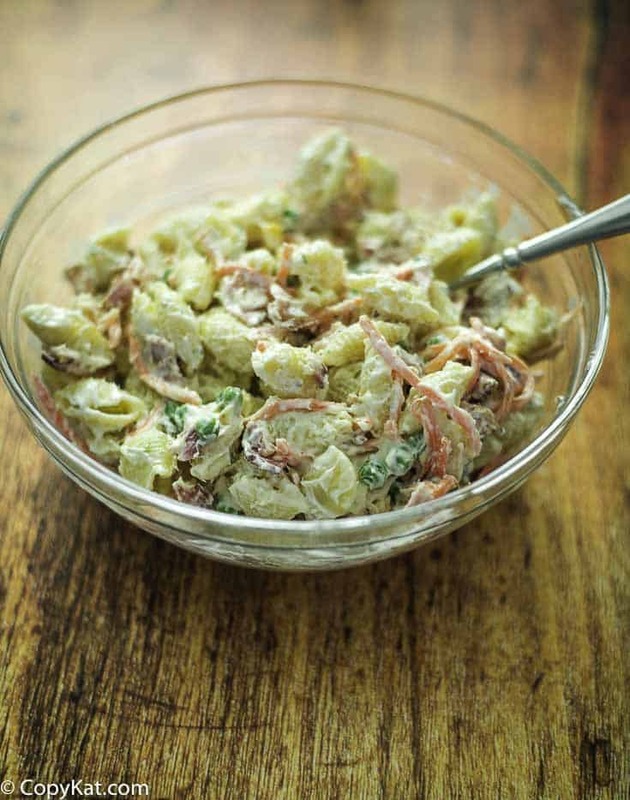 However, you can make this pasta salad at home without using the prepackaged mix. Pasta salads are ideal for picnics or a potluck. I get requests for this pasta salad for every get-together and cookout. It might be true that real men don’t eat quiche or salads, especially if salads conjure up images of dainty lunches for ladies. However, pasta salads are robust combinations of pasta, vegetables, and often cheese and meat, bound together by a distinctively-flavored dressing. Pasta salads are decidedly macho and the men in your life will love them. Pasta, of course, is associated with Italy where they take their pasta very seriously. But pasta salad is actually more American than Italian. Italians generally prefer their pasta hot and served as a separate course. Pasta salad is relatively new in the US as far as culinary trends go. It only really became popular starting in the 1980s when there was a mayonnaise-based macaroni salad that could be found in every deli and became tiresome. Rinse the cooked pasta in cold water. Normally you wouldn’t do this with pasta, but it’s necessary when preparing a pasta salad to keep the pasta from cooking further. Cool the pasta completely before making the salad. Choose your brand of pasta carefully. Although pasta is cheap, spend a few extra pennies on a name brand that you trust. Thanks for my readers who sent in some good ideas like this one. If you think that using mayo makes the dish too heavy, swap the mayo out for sour cream and a few splashes of milk. This makes the salad creamier and lighter. 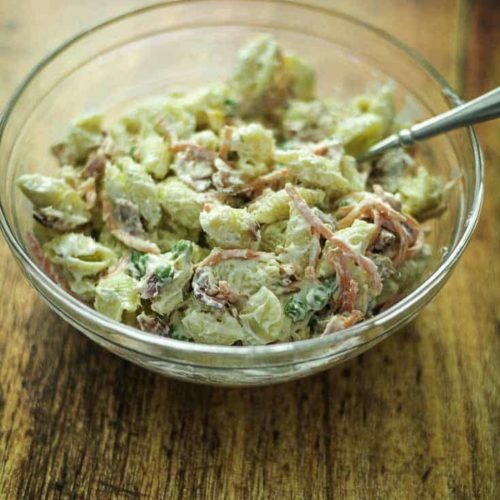 Want Some More Copykat Pasta Salad Recipes to Try? You can make this Suddenly Salad Ranch & Bacon Salad in your kitchen. 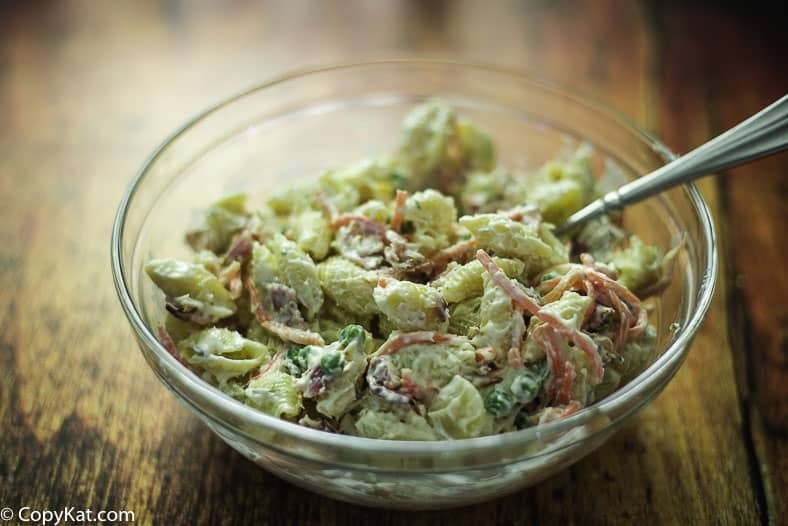 Pasta, mayonnaise and a few extra ingredients create a very flavorful pasta salad. And, the crispy bacon adds a nice flavor. This is a great knock-off recipe – in fact, it’s even better than the box! You can make Suddenly Salad Ranch Bacon Salad at home. This is a great knock-off recipe - in fact, it’s even better than the box! Bring water to a rolling boil in a saucepan. Add shell pasta and carrot shreds, allow them to boil, uncovered, for 10 minutes. Drain into a strainer and rinse under cold water. In a medium-sized bowl, mix together the peas, the entire packet of ranch dressing mix, bacon bits, onion powder, and mayonnaise. Add pasta and carrots. Stir together until everything is coated with mayo-seasoning mixture. Chill and serve. I used mayo the last time and thought it was too heavy. So this time I used sour cream and a few splashes of milk and it was creamier and lighter then using the mayo. So much better.Very yummy. Thanks so much for this. A few years ago they started packaging this product with the tiny shell pasta instead of the medium shell pasta (cheaper for them, same price for us) so I have boycotted them, but loved the flavor and will give this a try. WOW! This is a great knock off recipe–in fact, it is better than the box! I found the young peas in a can to be a little to soft, though. Next time, I will try the frozen peas for more cripsness. But it is GREAT! Thanks for sharing this recipe. My family loves this salad, and they were out of it at Shop Rite todaY!